- Marc Trestman is back in the CFL. Trestman and Jim Popp will try to duplicate the success they had with one another in Montreal where they went to three Grey Cups winning two of them, I think it is a little too late to think an instant turnaround is coming, I also think it is a little too late for Toronto. In making the hiring, the Argos said "Its the beginning of a new era!" Isn't that what they said last year when they moved into BMO Field? Isn't that what they said when they won the Grey Cup a few years ago? I don't think Trestman and Popp move the needle at all when it comes to interest in the Argos in Toronto. If they do, it won't be by much. If wins come, there will be more interest, but this team is a long ways away from being on the radar of Toronto sports fans again. One couldn't help notice that the signing comes as A) the Blue Jays grapefruit league season begins and B) the NHL trade deadline comes with the Leafs serving as buyers. I want to see the Argos succeed for the good of the entire CFL, but it isn't happening. Sadly, I see that trend continuing. - Now that Trestman is there, I ask you this though: Is their rebuild going to be better than that of the green-and-white. I think the Riders are a better team, but Trestman makes Toronto a better team as well, Where will each of them be in two years time? Where will each of them be in one year's time? If the Argos have a better record than the Riders at the end of the 2017 season, I shudder to think what it will be like around here. By the way, I don't see that happening! - One had to wonder what Drew Willy was thinking when Trestman said his starting quarterback is Ricky Ray. It had some wondering if Willy could be on his way out of Toronto and if he ends up back here. Why not! Let's throw his name into the revolving could he be our quarterback door! - The CFL held a board of governors meeting in Arizona lately, but no one seemingly wants you to know about it and tell you what was discussed. When the NHL or MLB board of governors meets, it's somewhat of a big deal with information being dispersed. The same when NFL and NBA league meetings are held. With that being said, why does the CFL keep sticking its head in the sand? It is OK to talk about your league and its goings-on in the off-season. It keeps the fans engaged, and that is what you want isn't it? On Tuesday, I watched a show on ESPN that had 3 hours of NFL talk. Wouldn't that be nice once a week on TSN? Wouldn't it be nice if the league created some headlines while at the BOG meeting? Wouldn't it be nice if they let their fans know what they are up to instead of hiding under a veil of secrecy? Are they hiding something? They seemingly want so much, but do so little. - Speaking of which, CFL Week is just about upon us. Can you feel the buzz? The league has a great idea, but they seemingly want it to fail. Why? The initial announcement at the Brewhouse was met with great favoritism. Everything went silent until an event at Mark's a couple of weeks ago and now its silent again. 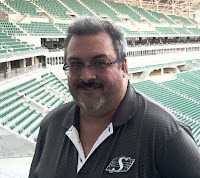 Yes, a conference call was had on Thursday, but does the league think Rider Nation will make this a success because of their love for football? Many still aren't even sure what's going on and if the league thinks fans from other cities are coming, they better think again because hotels aren't full for that week. I had someone from Edmonton ask me what was going on. Shouldn't they know? If this event fails to do what the league thinks it will, they will have no one to blame but themselves. Marketing your product shouldn't be that difficult, but on the surface, it apparently is. The beat goes on. - Congratulations to Jordan Weal. The former Regina Pat got his first NHL goal Tuesday night for the Philadelphia Flyers in a win over Colorado. Weal has been with the Flyers for a while now. Is he going to stick? Many hope he does. - Congratulations to Colby Williams. The former Pat let it be known via Twitter he has signed a contract with the Washington Capitals. With everything that kid has been through, here's hoping he gets some time in the show. He deserves it dont'cha think? - A reader of this blog threw out the name Rick Rypien when it comes to all-time greatest Pats who would be on their Mount Rushmore as I alluded to in Monday's column. If heart and desire were your top two categories, he would absolutely be there, I thought about what attention Rypien would have on this current Pats team. He had a lot of attention on what were bad Pats teams, so imagine what it would be like on this team of stars. He would be right up there with the players of today that are making this team special and he would create some extra ice for them with his play. That is a guarantee, If Rick were still here, the Brandt Centre roof might come off if he performed a ceremonial puck drop. - This Oilers fan was hoping Brandon Davidson could find a way to stay after the Vegas expansion draft, but he couldn't. I think Edmonton could have gotten a lot better for him than David Desharnais, but it was a deal that had to be made as the Oilers risked losing him for nothing. If Benoit Pouliot ends up going to Vegas instead, I might be more OK with this deal, In the end, it is two players who have been struggling looking for new starts. The deal gives Edmonton some more depth at forward. - Speaking of the Pats, why is it a two game losing streak causes doom and gloom. This Pats team has basically nothing left to play for. They are trying to get healthy and they are coasting to the finish line. Yes, they are coasting. - Did John Paddock do too much in trading some guys away? I say the answer is no as they are still a solid bet to be in Windsor at this year's Memorial Cup. As I said on the Cage Wednesday, this team is by far and away (sorry Moose Jaw) the best team in the Eastern Conference. I don't know if they can beat Everett or Seattle in the league final, but they will be there. Paddock hasn't made many mistakes since he's been here, and if this doesn't work out, I expect he will take the blame and every catcall that comes his way. I don't see it happening though----not until the final at least. It should be a great one tonight at the rink as the Medicine Hat Tigers visit. It's a battle of division leaders, and the Tigers come in hungrier than the Pats as they are trying to fend off Lethbridge. Teams have more to play for generally win games so if that Pats losing streak hits 3 tonight, I won't be shocked, but it won't have my confidence waning any Let's start the playoffs already! - Good luck to Dave Taylor and the U of R women's basketball team. Another trip to the nationals could happen tonight with a win over Winnipeg in Saskatoon. If that happens, this blogger may have to make his way to the U of S campus for Saturday night's conference final. - Good luck to Adam Casey. It won't be easy facing the likes of Kevin Koe, Brad Gushue, Glenn Howard and others at the Tim Horton's Brier, but he will give it his best. I don't know how he finishes, but I think he will have a better week in St. Johns than Penny Barker had in St. Catharines. I hope he does as do many Saskatchewan curling fans. - The Montreal Canadiens know how to do it right. The video tribute they gave to PK Subban Thursday night was tremendous. Let's hope a certain football team is taking notes and does something similar when a quarterback from Montreal who used to call Saskatchewan home returns. He deserves it and the fans deserve the opportunity as well. Looks like I went back to talking CFL for a bit. Sorry! - The Arizona Coyotes announced Thursday when fan appreciation night is. I wonder what they are getting for the guy or gal. That's all I got. It's supposed to be plus 9 on Saturday. Have a great weekend! I'm not worried about CFL week. 300 Tickets for every event are gone already so there is plenty of interest, I don't think they intend on having thousands and thousands of people to begin with. Wasn't at Tuesday's Pats game, but I know they did something with the Canadian Mental Health Association. Just wondering how much Rick Rypien talk there was inside the rink. I don't need to tell you about Rip's mental health problems. Did the Pats miss a golden opportunity here? Considering the facilities being used for CFL week, 300 is capacity. So its a sell out, I'm sure the CFL haters and Madani will find alternate facts to make it appear as a failure. I've got my tickets and am looking forward to a great week. Here is what disappoints me about CFL Week. I was excited to go to the combine and was told the public could go for free. I am on Twitter yesterday and hear all tickets for the combine are sold out. There was never any announcement from the league about having to buy tickets. Now I am left out in the cold. My chances of attending are now 50/50. Thanks CFL! I don't think a video tribute is necessary. He moved on, for more money, and that's football. Durant will go down as one of the Rider great's, but he is now the enemy, until he retires. I can see something after he retires, but not now. First time Austin came back after coaching us to the Grey Cup he received a standing O, and well deserved, but no tribute, and the Rider's went on to spank the Ti-Cats that game. This event is held in Saskatchewan and your saying 300 tickets are sold for each event is good? Seeing Rider fans are supposed to be the biggest fan base and have 30,000 plus fans a game, I really believe that was a dumb comment above, this event should have at least over 1,000 tickets plus sold easily. Come on rider fans, get it together to set the bar high to start this event in the right direction for the CFL. Once again Scruffy ahows his deep seated inability to understand JR hockey. What he fails to put out is that the Pats have a .500 record in their last 10 games. They have lost to every team above .500 that they have played at home recently. You don't lower your play because the other team is hungrier?? what a stupid comment. In case he hasn't looked yet, the Pats don''t have 1st place locked up yet as MJ is still in that conversation. They haven't locked up the Conference or the League. Who says they don't have anything to play for? How stupid. If the pats don't get it going soon, they will be gone early in the playoffs. There are four or five teams playing much better than they are. Some people can't see the forrest for the trees. Right now the Pats barely have two lines with nothing after that. Their goaltending is average at best and their defence is soft. It shows in their play. Too bad they can't play bottom feeders most all the time . After all that's how they built their record. The above commenter just has a deep seated inability to give this team the credit it deserves. This just in---teams don't play perfect games and they will lose from time to time. Would you like to make a wager on Moose Jaw catching Regina. Of course you wouldn't because you're a blowhard like 95 percent of the anonymous nutsacks on here. POPP TRESTMAN... IT STILL SOUNDED TOO GOOD TO BE TRUE WHEN THE RUMOURS STARTED, BUT THERE WE GO. IT GOT THE ATTENTION OF CFL FANS, BUT ARE ANY OF THOSE IN TORONTO? I HOPE THE ARGOS CAN GET BACK TO GOOD HEALTH. IF THINGS GOT BACK ON THE RAILS THERE AND THEN WE SEE SOMETHING HAPPEN IN THE MARITIMES, THAT WOULD BE AWESOME! EVEN WITH ALL THE QUEBEC FOLK, I WOULD STILL PROBABLY MOVE TO MONTREAL FOR AN EXTRA 150K. I FIND IT KINDA SAD THAT WE DIDN'T VALUE THE QB ASSET THAT WE HAD, MORE SO THAN FEELING ANY KIND OF BITTERNESS TOWARD DD. I DON'T SEE THE NEW ERA RIDERS HAVING ENOUGH CLASS TO DO ANY KIND OF TRIBUTE. MORE LIKELY THE GUYS ON THE MAXTRON TEAM WHO DO THE USUAL FORMER PLAYER MOMENT WILL LIKELY GET YELLED AT. I MIGHT HAVE TO DO SOME MORE CURLING, IF SK KEEPS DOING SO BADLY. Why are the "Media" promoting Drew Willey to Riders? He is not even as successful as Kevin Glenn so why would we want him?Lets get excited about the young guys we have not another recycled guy like Willey. He is oft injured and has happy feet. Jeez guys give it a break already. Not at all in favour of Willy but talk about happy feet! Glenn is great until the game is on the line and he is pressured. Then the happy feet start and he throws an interception! WHY DOES THIS ONE GUY ALWAYS TYPE IN CAPS! Pats built their record playing bottom feeders, what a stupid comment! Does Moose Jaw not play the same bottom feeders as well?? Then why don't they have the same record as the Pats. Are you saying Moose Jaw only beats teams with better records and doesn't beat the weaker teams as well?? Some people just cannot handle the fact that the Pats have had a great year so far and thus they post stupid comments like that and also they are wise enough to predict on how the Pats and MJ will do in the playoffs. It would be great if MJ was upset in the first round and then hopefully these idiots would crawl back under their rocks and spare us from reading their pathetic comments. Lol @ "still a solid bet to be in Windsor at this year's Memorial Cup." I sure hope you are right. Paddock will look like a genius if the Pats make it that far. An absolute genius. You ask why the media is mentioning Drew Willy...okay I will explain this really quick because its common sense. Drew Willy yes is inexperienced in comparison but has a possible 7 to 10 year window of playing and is in his prime years which could be a benefit to a team in need of a Qb...yes I know he hasn't won a grey cup and little play-off experience which means he could be a big factor or non factor in the play-offs, tough to say. Still has a lot to prove. Kevin Glenn is 38 before the season starts so he maybe has a year or so left and then what...he has decent stats but is tell me which starting qb he is ahead of out of the nine teams...none, he is dead last in this scenario and yes Ray is still better then Glenn by a long shot with grey cup rings to show he is good enough even injury prone to be ranked better then Glenn...38 and no grey cup rings and I believe started in one grey cup final I believe, I could be wrong. Only thing that may change minds on looking at Willy is his contract which I am unsure of but he did play well with Sask in his rookie years so he could be your guy. yup,gave up a "bona fide" starting qb for nuthin!...jus like pedersons' analogy following 2011 season...nuthin!! The facilities will only accommodate 300 fans, it's a sell out Moron. If the facilities could accommodate 1000 it would sell out. What is so difficult for you to understand? Pats have lost 2 straight going into tonight and have not lost 3 straight and yahoos are saying they are done. I guess have a deep seated inability that realizes what kind of idiot that one poster is. It's a colossal failure. Limited advertising , no league hype exposure. Failure across the land, Bush league. But for the few, enjoy. I hate it when people claim DD left for more money. He left because the current management of the Riders lowballed him. Hmmmm Warriors win 8 in a row Pats lose 4 in a row.